Stats and leaderboards will be added in separated tutorials as I will do much more complicated stuff there. 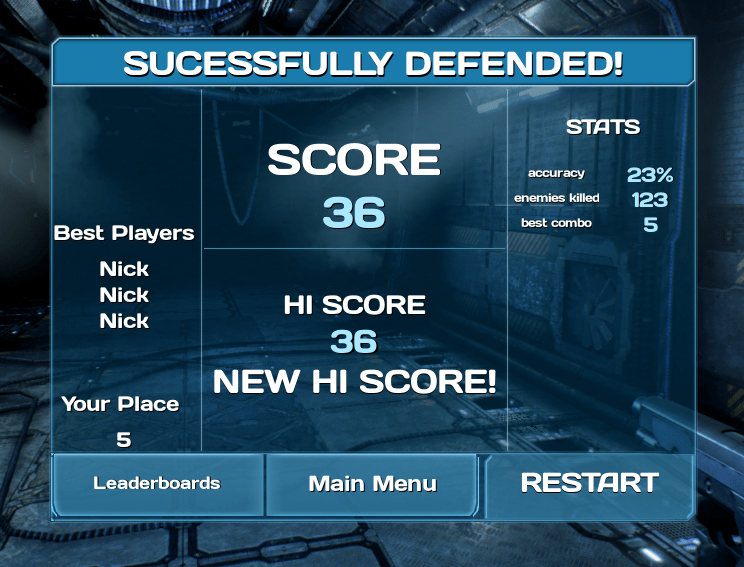 In ShooterGameInstance there is Levels array which stores hi-score for each level. Before moving forward open Save_Instance save class and add the same Levels array. Please read the comments on the blocks as it is critical how to use Find In Array node after changing some values. Next part is to create functions that will open main menu map and gameplay map selected by player. That’s all in Game Instance! This UMG is complicated and the best way would be watch Live Stream. ShouldAnimOnBeginPlay bool Editable. 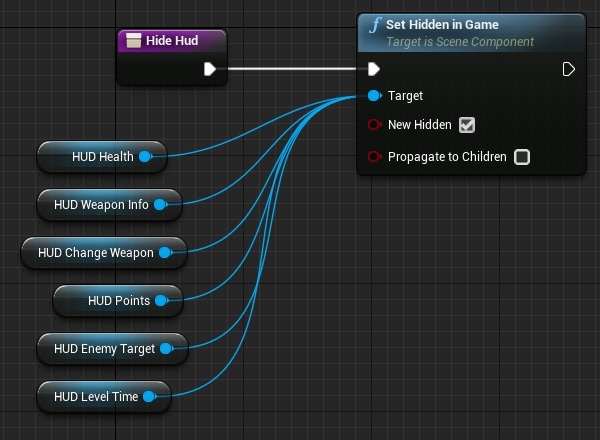 This will trigger animation without calling function. CustomText string Editable. This will be used for text if ShouldAnimOnBeginPlay will be true. Now create new widget named UI_SummaryScreen. bNewHiScore bool Editable. Expose on Spawn. We will know if show new hi score text. bPlayerWasDead bool Editable. Expose on Spawn. We will know which title UI should have. Points float 24 Editable. Expose on Spawn. Just storing points. HiScore float Editable. Expose on Spawn. Just storing hi-score. 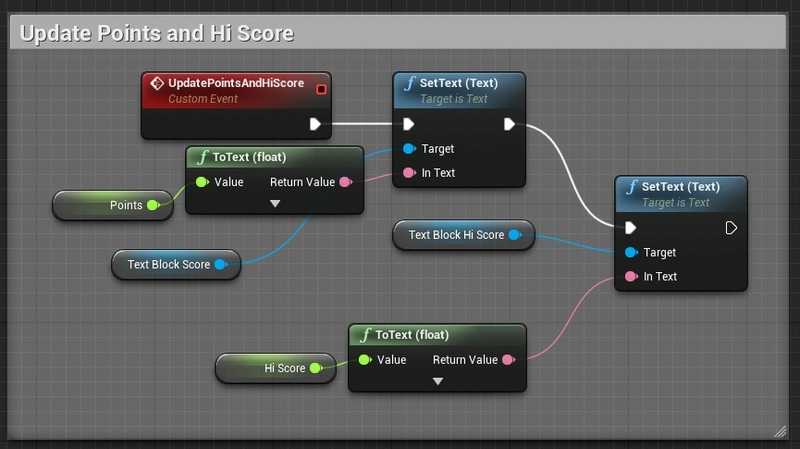 These are just simple events changing widgets on variables changes. We need to know when game ended and if player was killed. Open GameplayCharacter and add OnPlayerDeath dispatcher. 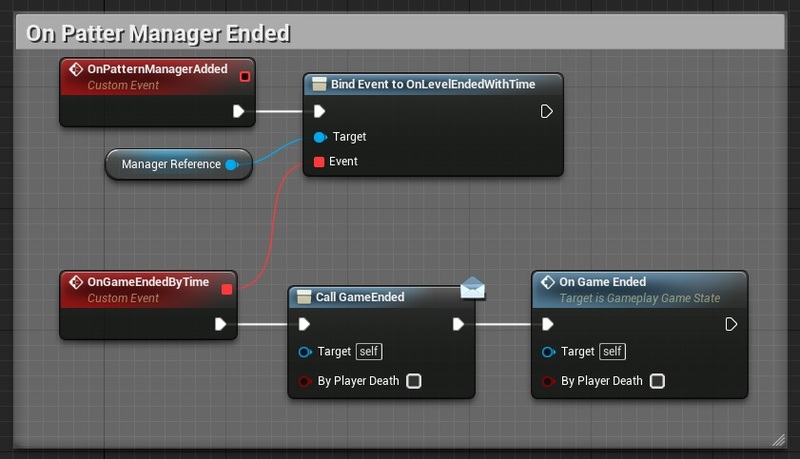 Open GameplayGameState and add OnGameEnded dispatcher with one bool input named byPlayerDeath. This is basically checking if there is new hi score – if yes it’s submitting it to ShooterGameInstance. Now we have end game communication. Both for player death and level finished from pattern manager. Its just hiding all 3d widgets. So it won’t be shown if player is dead or patter manager ended. Now it’s time to update Level Selection UI and Actor to pass the chosen level data to Game Instance. In UI_LevelSelectionActor there is a lot of bindings in Begin Play to communicate between level selection and weapon selection. The problem is that 3d Widgets in Standalone Game aren’t loaded in Begin Play, they need more time to load so Get Widget Class will result Null. Delete Begin Play event and add new custom event named BindWidgetsEvents. Just replace Begin Play with that. This way I’m passing the data to Game Instance. But if we don’t have Begin Play now all of the bindings won’t be called. In this example I’m triggering the Widgets when player is near so I can use this event to call BindWidgetsEvents. This way Widgets will work in Standalone Game. execute console command “RestartLevel” is restarting the level but the player character controller is seams to be null because I can’t move with the mouse and any hotkey like “G” for weapon selection is not working. maybe there any other way of accomplishing Restart? Make sure your controller is in mode: GameOnly. Maybe some UMG widget is still here and controller is in UIOnly mode. And my High Score is always is illustrated as 0. Maybe you didn’t mentioned where you assigned the velue of the Current points to the HighScore variable? when i am clicking the play in weaponselection umg, where we select the weapon for playing and shooting with them, on click that button I am doing there the same casting to the shootergameinstance and getting from there the OpenGamePlayLevel function, as we did in SummaryScreen, it is not working and not loading but closing the playWindow. Can you please explain why that issue is happening? 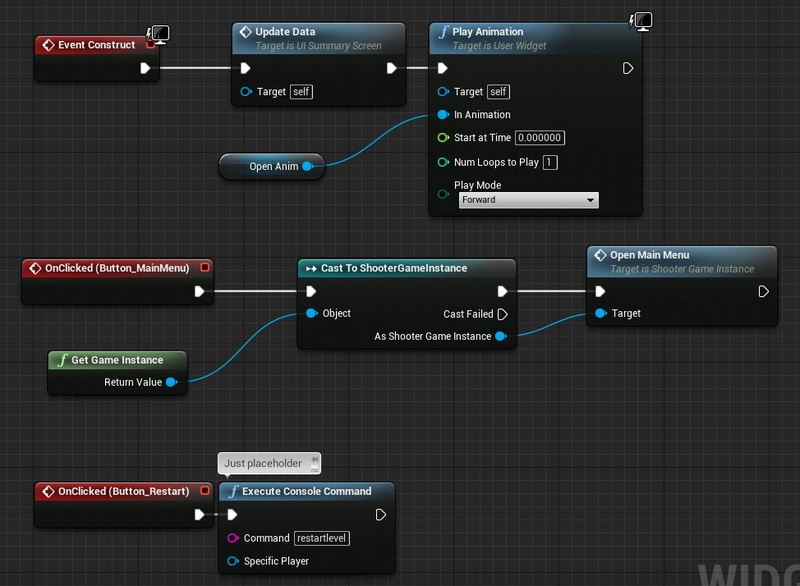 Now, in your Game Instance node, find the “Levels” array variable, and populate all the “Level to Load” fields. If this is left blank the PIE window will simply close, complaining about invalid URL path. Filling these in with map name(s), you should be good to go.